ibVPN provides a decent VPN service at a very good price. The speed or performance is not out of the ordinary, but we've had no issues with browsing, streaming media or torrent downloads. We feel that the service is definitely a go-to when looking for an affordable and secure VPN service. We are looking forward to some improvements in the infrastructure. ibVPN is another provider receiving a place in our VPN Reviews section. This ibVPN review should help you decide whether ibVPN is a good VPN provider or not. 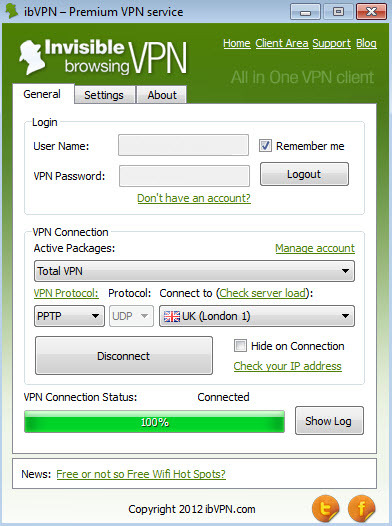 ibVPN (Invisible Browsing VPN) is a paid VPN provider operated by a company in Romania (Amplusnet S.R.L. according to their contact page and domain whois data). ibVPN provides VPN access using the following protocols: OpenVPN (TCP and UDP), L2TP/IPsec, PPTP and SSTP on selected servers. They operate 38 VPN servers (as of April 1st, 2013) located in the following countries: USA, UK, Sweden, Germany, Netherlands, France, Canada, Italy, Ireland, Romania, Russia, Sweden, Panama, Luxembourg, Hong Kong, Switzerland, India and Spain. According to their VPN status page, they have 24 servers connected to 100 Mbit/s and 14 servers connected to 1000 Mbit/s. They allow P2P traffic on some locations (Netherlands, Canada and Luxembourg) and they also run an interesting DNS service, allowing their customers to unblock streaming sites without using a VPN (check our previous post related to such DNS unblocking services and how it works). They also provide proxy access in some countries. In order to use the DNS unblocking service, you need to add your IP address in the customer area and change your DNS server. ibVPN’s Servers status page is very nice and informative. 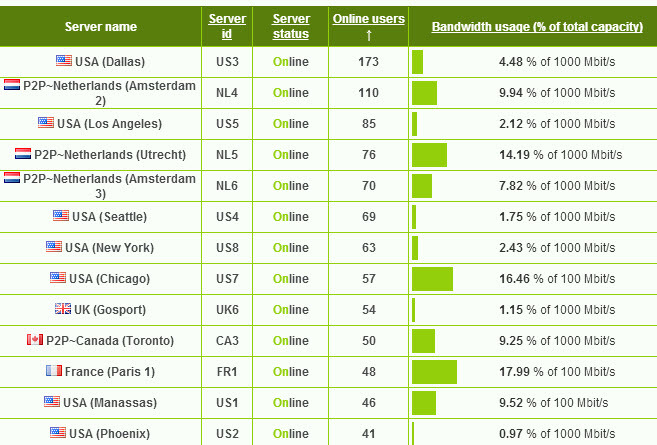 It is updated once every 15 minutes and provides a map with their VPN servers, bandwidth and user count statistics. So it’s a great tool to use before deciding what VPN server to connect to. ibVPN provides their own VPN software that you can use to connect on all protocols. 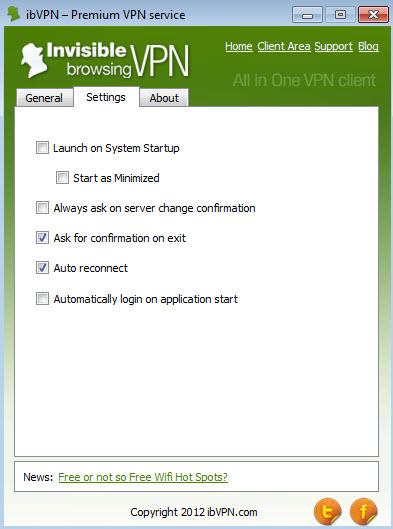 It installs its own instance of OpenVPN and adds two VPN connection profiles to Windows (PPTP and L2TP, which are dynamically updated and launched to connect to ibVPN’s servers). The software doesn’t allow you to choose OpenVPN’s port, but only the protocol (TCP or UDP). Digging through the software’s files, we noticed that it is using OpenVPN on ports 53, 80, 443 and 1194. They use the TAP virtual network device (Layer 2) for OpenVPN connections, instead of TUN (Layer 3, most widely used). We prefer Tun, but oh well… they probably have some good reasons for using TAP. The settings tab allows you to set the application to start automatically on System boot and to auto reconnect when the connection is dropped unexpectedly. The software also shows you the latest news from ibVPN and provides shortcuts to their VPN servers status and an IP check page. We had a few problems with the software: it reported that the VPN connection was successful, while in fact it wasn’t, and we were still browsing using the real IP. Here is where the “Check your IP address” shortcut comes in handy and should be used each time you connect to a new server. Overall, the software looks good and is an useful tool. 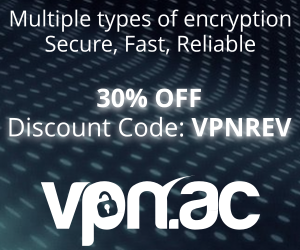 Pricing is very attractive and beats some of the major VPN providers in the industry. The cheapest plans start at $4.95 / month (torrent or location specific only), the middle plan (Total VPN) at $7.95 while the higher comes at $10.95 (Ultimate VPN). There are some other, more expensive plans, allowing more than 2 simultaneous VPN connections, starting at $19.95/month for 3 connections, up to $99.95/month for 20 connections. The discounts for payments made in advance are good, though. For instance, you can pay the Ultimate VPN plan in advance for one year and the monthly cost would be $6.9, instead of $10.95. Speed was decent in most of our tests. Their VPN servers in Netherlands are a bit slow, though. That’s not surprising at all – considering that people use those servers for P2P. Bit Torrent is a bandwidth hog. We also checked some of their bandwidth/hosting partners, and we like the fact that most of their hosting providers, like LeaseWeb, Ubiquity Servers, Softlayer, Private Layer are top in class for reliability and speed. We didn’t really like the speeds from Germany and we tried again later, when we managed to reach top speeds of 6MB/sec on OpenVPN. So there seemed to be a problem on our 1st attempts with our routing to their servers in Germany or something. Using a VPN server from US, while connected on PPTP VPN, we watched videos in both standard and HD quality from US streaming sites, such as ABC and Hulu. Transfer was really good and we didn’t notice any bandwidth hiccups. BBC iPlayer worked flawlessly while we’ve been connected to one of ibVPN’s servers in UK. They provide clear & easy to follow connection tutorials on their site. Fortunately, we didn’t need to contact support for any issues so we are not aware of how responsive their support team is. If you are/have been a customer of ibVPN, share your thoughts! Not what it was. There are no dynamic IPs anymore (what they claim they have is a lie), constant need to fill out Google captchas, forces you into their DNS which depending on server is often Google (which they claim they removed), censors any Web site which has either “torrent” in the domain name like TorrentFreak or even if it’s a Slashdot, Wired, or Ars Technica article with a title like “Torrent site taken down by RIAA”, the domain name or article is blocked. I switched to a better service a year ago. Great for torrents. I do not use it for other our purposes. Just the socks5 proxies that are fast and no leaks. This review needs an update. Many new features, new apps, good speed, awesome support, low price. One of the best VPNs out there in my oppionion. Very satisfied, ever since I switched to them 2 years ago. App very efficient and friendly. Customer care extremely helpful and fast in responding. Will recommend to my friends of course. I have tried several services reviewed by you, guys, and found out that the highest ranked are not generally suited for everyone. For example, I like ibvpn more than other vpns for the fact that offers interesting features, like smartdns, socks5, browser extensions, etc. That is why I recommend it to all my friends. Thank you, Andry, for the kind words. We are constantly working to improve our service and offer useful features. If you have special requests feel free to contact us and let us know your thoughts. They have a new app, i am using that they many new settings, i do not use it for anything special just online protection and it works great, however you need to be carefull with accounts like facebook as facebook if you play with your facebook open and you enable disable vpn too fast it will naturally detect an issue so you have to avoid that, but that is not a VPN issue i just made the mistake myself once. Price is perfect for me because i do not use any special services. I have subscribed with ibVPN for 4 months now and all I can say is: “So far, so good”. I am pleasantly surprised by their customer support and fast assistance, the speed and the fully-featured apps. Really hard to access web from Saudi Arabia but with ibVPN i have managed to do my work with minimum issues. Customer service always helped out so 5* for them here. I work in Saudi Arabia for about 3 months. Unfortunately, ibvpn does not work with all ISPs. I have contacted them several times and they managed to make it work with the mobile carrier but not with the Ethernet line.